Search for TrackServer in the search bar. The App is now installed on your device. When launching the App, you'll be prompted for your login details. Simply type in the field the login for your account. The login corresponds to the 6 digits ID of your tracker or the name you chose for your account. If you have a password on your account, you will need to enter this one to access your device(s). Once logged in, a list with all the devices in your account will be displayed. 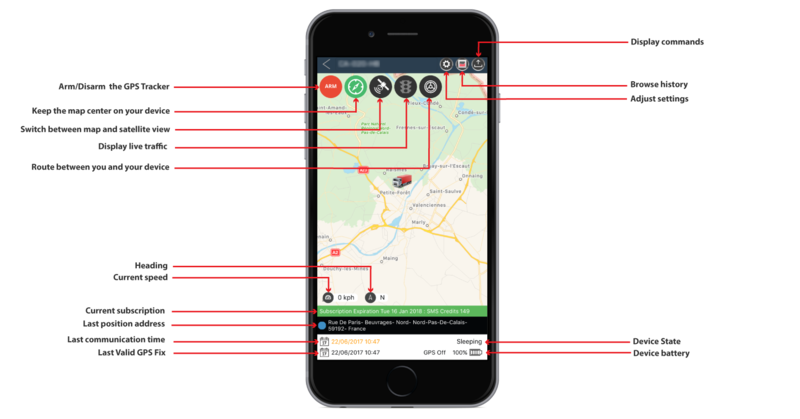 For each tracker, you'll see several information such as the battery, the device status, the GPS status, the last command sent to the unit and the address of the last location. At the top, a cog icon allow you to access the settings for your account. By clicking a device in the list, you'll access the map with all the details related to it. To access the account settings, you'll have to click on the cog icon located on the device list page. To access the device settings, you'll have to click on the cog icon located on the map page. Concerning the account, you'll have the ability to update the unit speed, the date format, the language and also reset your password. The device settings give you the opportunity to update the device name, define a low battery level to receive alerts, register contact numbers or emails and select the different types of alerts you want to receive. By clicking a tracker in the device list, a map with the tracker's last position will appear. You are free to switch between a map or a satellite view. This page gives you a lot of information about your device such as the current subscription, the address of the last position, the last communication time, the last valid GPS fix date, the tracker state and also the battery left in this one. At the top of the screen, several icons allow you to activate features on the device. If required, you can display the live traffic density on the map and also calculate the faster route between you and your tracker. The live traffic shows you the density, if the zone is really crowded, you'll see a red line or you'll see an orange line if it's a medium traffic density. The App will ask you the authorization to track your current location in order to use the routing feature. This feature simply calculates the faster router between your position and the tracker and displays it on the map. From the tracking page, you can navigate to the history of your device. You'll prompted to select a date for which you want to display the history on the map. A button at the top of the screen allows you to toggle between the map view of the history or the list view of this one. A toggle switch at the top right of the screen gives you the ability to display the history for all the trackers in the account or only for the current one.